An eight-year-old girl narrowly escaped serious injury when a television was thrown from a third floor window of a house. The girl was walking away from the Prince Regent swimming pool, in Brighton, with her mother around 6pm on Monday (January 18) when the television was thrown from the window in North Place. Sergeant Rob Bowden said: “Luckily, the little girl’s mum was alerted by the noise from above, looked up and pulled her daughter to safety. The TV still only missed them by inches and the girl slipped and fell as she stepped on to it as it landed in front of her. “If her mum hadn’t taken the action she did, I shudder to think of the consequences, which could have been serious injury or worse. “When she looked back up, a man was in the window and shouted abuse, but whether that was aimed at her or someone else isn’t clear. 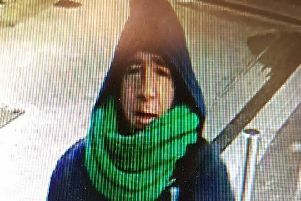 He is described as white, 20-25, with short dark hair and wearing a grey hooded top. “Soon after, three men were seen to exit a ground floor window of the house and run past the entrance to the Prince Regent in the direction of Jubilee Mews. If you witnessed the incident or have any information about the men involved, please email 101@sussex.pnn.police.uk or call 101 quoting serial 1163 of 18/01. Alternatively, you can call the independent charity Crimestoppers anonymously on 0800 555 111 (www.crimestoppers-uk.org).